I can hear them well before the sun rises. They are up breaking camp, preparing for the day, making us breakfast. 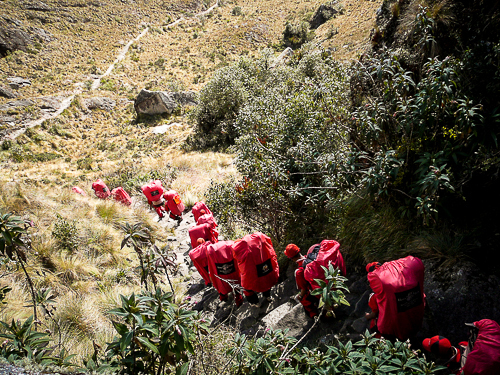 They each carry 25 Kg on their backs over the same trail that I struggle to negotiate. They leave after we leave, pass us on the trail, and arrive at camp before us. They applaud us as we leave camp, and again as we enter camp at the end of the day. Seriously, they applaud us. They are, in a word, amazing and I am in awe of the work that they do. Watching the porters on the trail it is easy to see that there are many levels of support. Many carry their loads in a traditional manner tied to them in a way that I can’t figure out and that looks precarious at best. Some wear only leather sandals cushioned with dried grass that they gather on the trailside. Some travel alone, others in small groups. 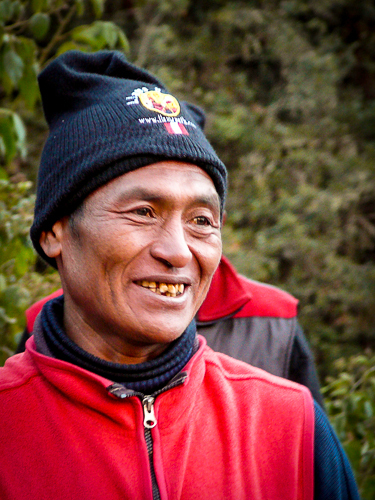 The porters of Llama Path seem to have a sense of camaraderie and look to be well supported in the job that they do. They all wear a uniform that, at first, seems a bit much but, in the end, shows that they are well dressed and taken care of. They all have decent clothes to wear, good shoes on their feet, and a backpack on their back that best carries the load. They travel together, in a pack that is impressive to see coming and going. 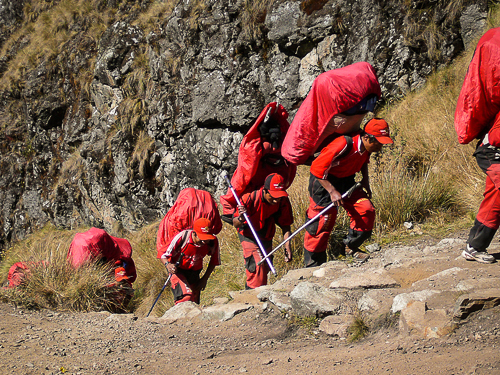 They typically are native Andean men, made of sturdy stock with strong backs and legs, who do this work for a little while and then return to their villages with the money to support their families. 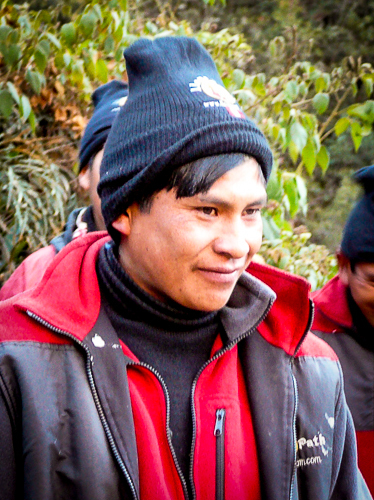 They are all kind, smile easily and have a good rapport with the tour guide, often laughing and joking with him. They work hard but also have plenty of downtime when the work is done. Then they can be found chatting in small groups, checking their cellphones, playing soccer if there is room, or sleeping just about anywhere a body can lie down. 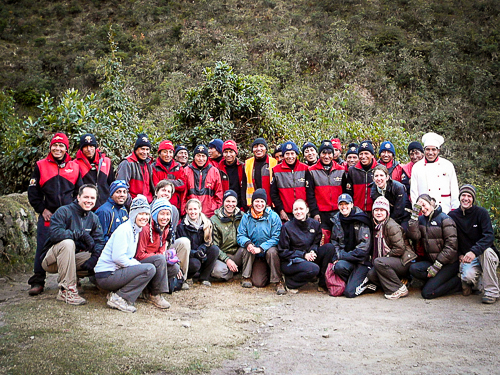 We are grateful for the work they do, realizing just how difficult this trek would be without them. We take to applauding them loudly as they pass us on the trail. It’s the only way we know to show them how much we appreciate them and the work that they do. Well, that and the handsome tip we all eagerly gave at the end of the trail.